This Red or black Stainless Steel Medical ID Alert Dog Tag is sturdy yet simple and has a nice smooth finish. The stainless steel ball chain is 30”long, but can easily be cut to your desired length with a pair of scissors. 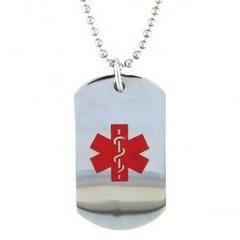 This medical dog tag is 1 3/4" long and 1" wide and the medical alert symbol is on the front in red or black you choose!! Great boys and girls, men or women.